I clicked off my headlamp and looked at the swirling stars above. Then I leaned over the side of the trail and threw up. This had been going on for too many hours to count. And it didn't matter anyway. I was alive. Vomiting, but alive, and somehow I was managing to hang on. Still heaving, I started moving again. It was cold enough that I could see my breath in the air, and I knew I couldn't stop for long. Movement was the thing that would keep me warm. All I had to think about was this step, and then the next one. I didn't even think about how far away the next aid station was, or the finish line. There was a simplicity to boiling everything down to practically...nothing. And in spite of all that had gone wrong, there were still so many things that were going right. I could honestly say that at this moment, I was happy. There was nowhere else I wanted to be and nothing else I wanted to be doing. Just this: right here, right now. Going into Lean Horse 100, I knew it was my best bet, or perhaps only bet, for finishing a race that was a hundred miler in its own right. I'd covered the distance once before, during 24 hours at Across the Years. But at my subsequent attempt-- Javelina Jundred last fall-- I found myself face down in the desert just 66 miles into the race, and I'd taken my first ever DNF. One thing that gave me some confidence was that training had been much more consistent for Lean Horse. Which is to say, I had managed to stay injury free. I began increasing my mileage in January, slowly and steadily, and by March I staying strong with solid 50-60 mile weeks and no need to drop down. 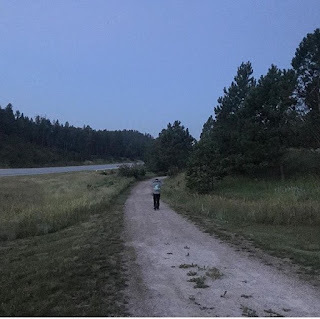 I did some higher intensity weeks--including pacing Rob overnight for the last 38 miles of Kettle Moraine 100, and a 44 mile solo trek (for my dyslexia charity run, maybe someday I'll write about that) in the thin air of the rugged Colorado Trail. 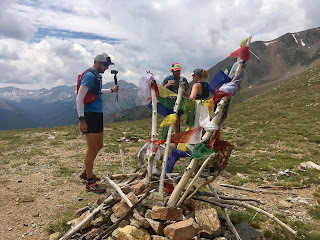 During peak training week, I hit 90 miles for the first time in my life-- celebrating at the top of Hope Pass (also my first time running at over 12,000 feet of elevation) with Rob and Team Steph. I was uninjured and reasonably well trained. Nothing in my work schedule prevented me from doing this. It was now or never. The problem was...did I really even want to attempt a hundred miles? I kept thinking about all the reasons why I had quit Javelina, and I knew that nothing had changed. The emotional baggage that had caused me to panic in the desert-- still there. The unrelenting nausea and vomiting that takes hold of me sometime between 8 and 12 hours into a race-- I'm nowhere near to figuring that out. Even more than these factors, I also knew that I'd have to be prepared to run this race alone, with no pacer. We didn't have anyone to go with us, and we would have needed at least one other person to drive Rob to the check point (Lean Horse is an out and back course) and then take care of Will for the rest of the night so that Rob could pace me. I had absolutely no assurance I would be able to finish, and in fact, almost every reason to believe that the same thing that had happened at Javelina would happen at Lean Horse. I didn't know if I would ever be able to recover from a second DNF. I think I reacted to this stress by turning off everything, and just remaining in this almost Zen, emotionless state during the weeks leading up to the race. 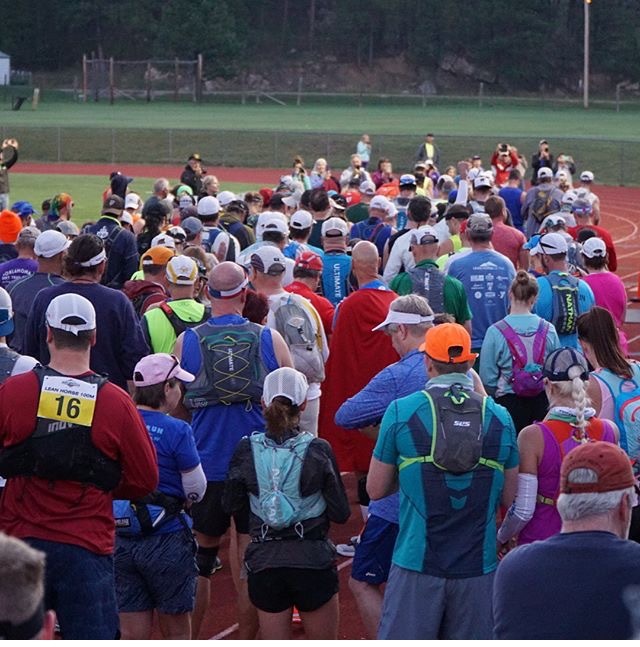 I still felt an uncharacteristic lack of emotion as I methodically chewed a peanut butter and jelly sandwich at 4:30 on race morning, as I stood shivering on the start line watching the sun rise. Then all of a sudden, we were off. Wasn't there somebody once who said 100 miles is not that far? I figured I would disagree with him by the time this thing was done. The race was on a rails-to-trails gravel path, which is basically my kind of turf. Not technical, no rocks or roots. There were supposedly "hills," but none of them were more than 4% grade. It's just that they might last for 10 miles at a time. Still, how hard could it be? Aid stations were like clockwork-- 5 to 6 miles apart, and Rob and Will were at every one. 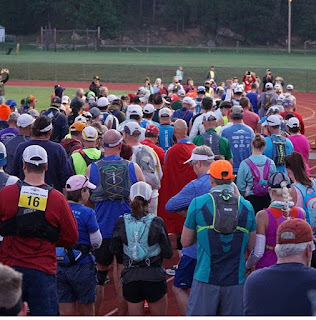 I think during the early part of the race, I mostly tried to avoid getting caught up with the 30-milers (it was also a 30, 50, and 100-mile relay event). I ate a watermelon shot-block about every mile, and I walked a little bit every two. 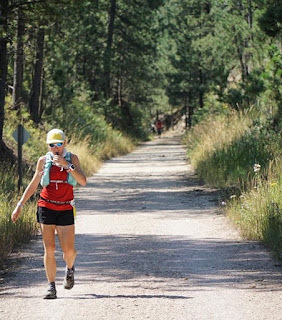 I caught up with a 30-mile runner named Katie around mile 10 and stayed with her until we hit her turn around point at Hill City-- mile 15. She was great. She was just like me, and I wished we lived in the same town and could be running friends. We talked about our kids, and what a struggle it could be, but I stopped myself before I mentioned anything about what we'd been through during the past year. I think this had been my downfall at Javelina, when I was in the thick of it and started talking with another runner about how much it was killing me to pull my kid through dyslexia. I didn't go there this time-- I knew from Javelina that a hundred mile trail race is not a good place to fall into a panic attack and be unable to get yourself out. When I arrived at Hill City, I was ahead of schedule, behind on nutrition, and it was hot. Rob filled the tube sock of ice for me to put around my neck while I ate some bites of a vegan grilled cheese from my drop bag. 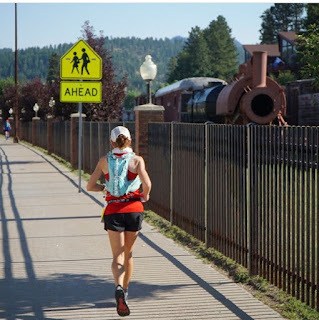 I walked out of the aid station, on the only section of pavement the course had, as we took a bit of a jog through town to get back to the Mickelson Trail. I tried to memorize the details of the streets, and I wondered what it would look like when I came back through here in the dark at mile 85. The heat was becoming more of a factor, and I finally understood why people had said you needed to be careful of the "hills" in this race. Even a mild grade feels taxing on the legs when it lasts for 10 miles. It is different than running steeper, but shorter hills, where your body gets a clear signal that you need a walk break. My legs were definitely sore, in a way that was somewhat alarming, by mile 25. I was also not handling the shot blocks and homemade grilled cheese so well anymore (that was the entirety of my nutrition plan). 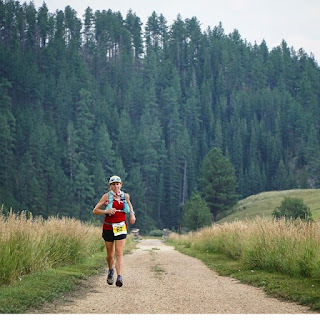 Swallowing pills made me gag, so at aid stations I began emptying the contents of an Endurolyte and a ginger capsule into a cup of ginger ale and then swigging down the cocktail. Not bad. The sweetness was unappealing though, and I didn't feel like eating solid food. I drank some lukewarm vegetable broth at mile 25 and this seemed to bring me back to life. Heading out of the aid station with purposeful strides, I thought, this was how I was going to make it. Vegetable broth would see me to the end. The next 5 miles went by in a flash, which I don't think anyone was expecting. It was all downhill, at a very gentle grade, and I ran sub-10 minute miles the entire way without walk breaks or effort. The aid station at the end of that was the only time Rob and Will missed me during the entire race. I drank some more vegetable broth and got back on the trail. The next 20 or so miles were roughly uphill, and while I don't remember suffering that much, I did slow considerably. I knew that if I was going to finish in under 24 hours, I'd need to make it to the 50 mile mark by at least 10 hours, to allow myself a good cushion. And by this point, I knew that wasn't going to happen. 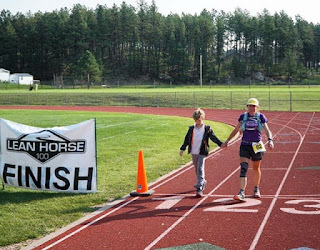 Eleven hours at the 50-mile turnaround seemed like a safer bet, and finishing the race at all was far more important than finishing it in sub-24. There seemed to be a lot of carnage in the final 5-10 miles before the turn around point. I wasn't moving so great myself but was passing people left and right. Uphill, no shade, brutal sun. I took it slow, but by the time I got to the aid station at mile 49-ish, I felt legitimately bad. Rob tried to get me to eat all kinds of food, but I shook my head. I didn't even want broth anymore. I didn't want anything. Runners were supposed to go out to the 50 mile mark, turn around, and then come back. I thought if I just walked that entire way, until I got back to the aid station again, surely my stomach would get under control. I'd be kissing 24 goodbye, but I'd be saving the race overall. Walking did not help my stomach, so I ran once I hit the turn around and it was downhill back to the aid station. I couldn't fathom putting anything into my mouth as I got back there, now mile 51 for me. "Do I have time to walk it into the finish from here?" I asked. Rob seemed completely bewildered. By all respects, I appeared to be doing well. 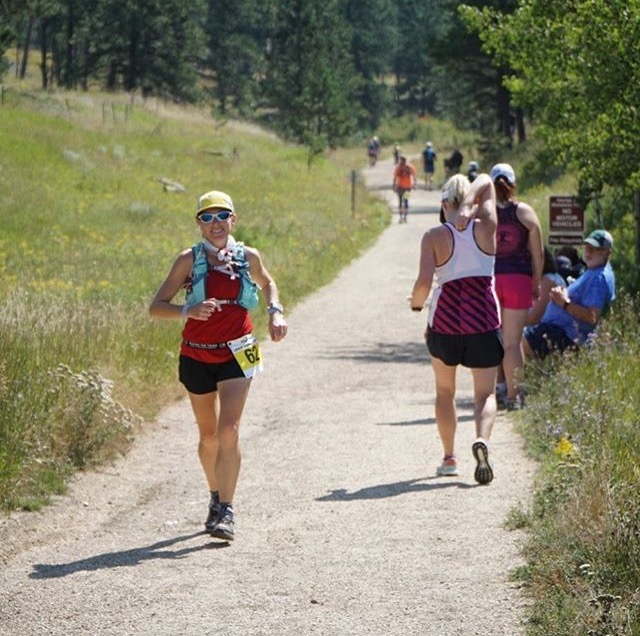 I was in the top 25 overall, I was the 3rd woman (of what... a dozen women in the entire race? ), and a sub 24-hour finish was still well within my grasp. I took some (vegan) chocolate chip cookies Rob had brought me from the van and drank a cup of coke. Rob raised his camera to take a picture of me, just as I vomited all over the side of the trail. There was a look of horror on his face that I could tell he was trying to mask with encouragement. I laughed and gave him two thumbs up. Throwing up was exactly what I had needed. I felt better than I had in at least 10 miles. I drank some water and nibbled on one of the cookies as I took off running. This wasn't the beginning of the end, I told myself. My stomach had just needed to be reset, and this had done the trick. Chocolate chip cookies would get me to the end. Everything was going to be fine. Most of the first half of the race had been a gradual uphill. Which meant most of the second half was a gradual down. The weird thing is how effortless it felt to be running it. I was suddenly moving at a pretty good clip again, and it felt like nothing at all. This was an asset. Although my legs had hurt early on, they were totally fine now. And my stomach had just gotten reset. Rob had fixed me a baggie of 3 chocolate chip cookies before I left, and I told myself to eat all 3 of them before I got to the next aid station some 5 miles away. I never ate the cookies. In fact, I never ate anything else for the rest of the race. I threw up a couple more times before I got to the next aid station. There would be this brief minute or two after each puke when I felt pretty good. So I'd drink water and whatever I had in my bottles (coke at this point, I think), and then I'd throw that up a couple miles later. The mile 56 aid station went by, and I ate no more food. I kept thinking that I needed to walk--slowing down was surely the key to calming my stomach. But the gentle downhill grade made running feel easier than walking, and I didn't want to waste anymore time. So I ran. 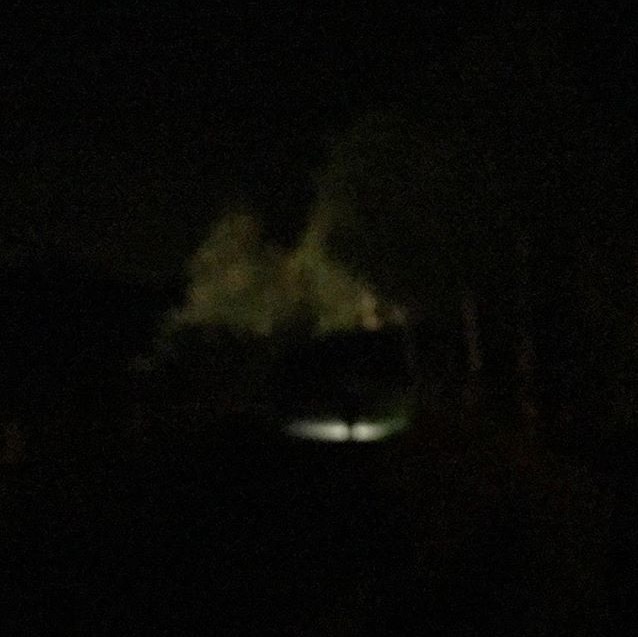 Just before the mile 62 aid station, it was dark enough that I clicked on my headlamp. Good. Now it was time for some magic. No more sun boiling down on me. Surely now I would be able to eat. But I couldn't. I pulled into the mile 62 aid station, my stomach a wreck. 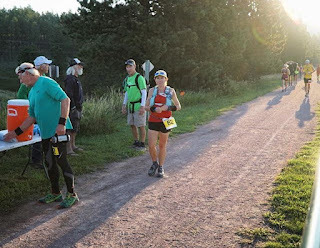 I'd also been visiting the port-a-potties at every aid station at least since the turn around point, but luckily, I'd never had to use the emergency ziplock baggie of TP in my pack. Even so, I didn't know what was wrong with me. I've puked in just about every ultra I've ever run, but this level of digestive distress was unprecedented even for me. I felt like I was running with the stomach flu. Now that it was dark out, I was uncomfortably cold. I stripped off my sweaty singlet for a dry t-shirt and tried to come up with something, anything I thought I could eat. No luck. I went to the aid station table and surveyed my options. There was a sign above the table that said "WE HAVE PBR." "Alright, can you hook me up?" I asked the volunteer. Everyone cheered as he popped open a beer for me. It was disgusting, but somehow delicious. It was liquid that wasn't salty or sweet, and it had precious calories that might buy me a few miles. I thanked the volunteers and Rob and Will (who was dressed in his Harry Potter costume), and headed out of the aid station. A mile later, I threw up PBR all over the side of trail. 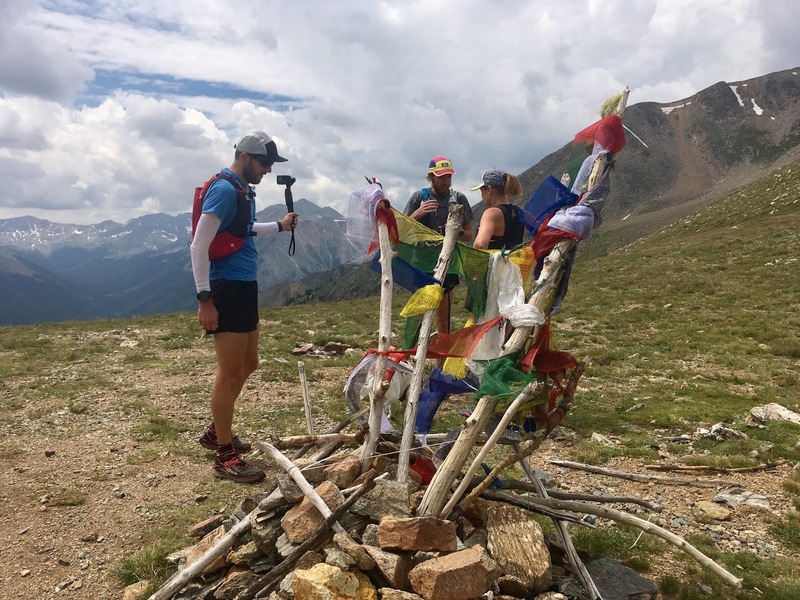 It was probably around this time that I settled into a groove of run, walk, puke, run, walk, puke, and repeat and until I got to the next aid station. It wasn't that bad really. I began thinking back to when I had hyperemesis, and I had wished there was more than one word to describe "nausea." This wasn't the worst kind of nausea you could have. I'd mostly just feel this low grade queasiness, then puke, and then have a few minutes of relief before it started in again. It wasn't like the all consuming, overwhelming, blinding nausea I had felt during Javelina. This was something I could handle, and that was an asset. I even started being able to time it so that I would puke shortly before reaching an aid station. This way, my brief window of consumption would occur while there was food available. I still couldn't eat, but by around mile 70, I told Rob, "Chocolate soy milk," and he ran to the van to get it while I went to the bathroom. He filled up my bottle, and I left the aid station thinking, chocolate soy milk will get me to the end. 30 miles to go. There were glow sticks placed along the trail for about a mile preceding the next aid station, and it was very comforting to see them lighting the way and knowing that I wasn't completely alone in the woods. I think it was about 10:30pm when I got to the mile 75 aid station. Will was awake after a brief nap, and he was wearing his Harry Potter costume. "Follow the glow sticks, mom," he said helpfully, as Rob topped off my bottle with chocolate soy milk. I nodded and continued. It had been 25 miles since I'd eaten anything. I still had 25 miles to go. And for the most part, I was still running. How was this humanly possible? Would I be able to keep doing this until the finish? The glow sticks dwindled outside of the aid station, but I didn't give in to the odd pang of sadness that brought me. Instead, I thought of Rogue One, when the characters were up against the impossible, and Jyn Erso gave them a pep talk that went something like, "We're going to take this chance, and the next, and we'll keep on taking our chances either until we succeed, or until all our chances are spent." Star Wars wisdom. This is what I would do. Once chance at a time, one step at a time. I had no idea how I was going to finish this, but I would keep on moving until I had no more chances left to spend. Sleep monsters came out to get me as I forged ahead to mile 80. I listened to music and popped massive amounts of caffeinated Run Gum, but even that wasn't keeping me awake. Whenever I slowed to a walk, the Sleep Monsters whispered to me that I should close my eyes, that I should lie down on the side of the trail. They made my vision blur in front of me. Even bitterly cold and shaking, my breath white puffs of air in front of me, I couldn't stay awake. My legs weren't really sore, but my body was shutting down. I tried to keep running as much as I could, simply because that kept me more alert than walking. Aside from the nausea and exhaustion, the biggest problem I'd had for most of the race was the constant feeling that I had to pee. At first, it made sense. When I'd stopped eating, I shifted to broth, coke, and ginger ale. More recently to chocolate soy milk. It was a lot of liquid, but I could barely make it 2 miles down the trail without stepping off into the woods to pee. It was growing increasingly uncomfortable at this point because it was so cold. And I had no idea where all that pee was coming from. I'd been vomiting for more than 30 miles, and it had been hours since I'd drank anything more than a few sips at a time. How did I have any liquid left in me? Was my body sucking it out of my muscles and organs? Was I dehydrating from within? During the stretch from mile 80 to 85, things became truly difficult. My legs were still fine, but running made me so dizzy that I could barely do it. Walking helped anchor my feet to the ground, but it wasn't keeping me warm or awake. I welcomed the lights as I headed into Hill City and made my way to the aid station. Still 15 miles from the finish. It was so close but so far away. For the first time since this had begun, tears welled up in my eyes. As Rob tried to fix a blister that had formed between my first and second toe, another runner and her pacer arrived at the aid station. I left before them, but I could see their headlamps behind me before too long. All I wanted, in the whole world, was to lie down on the side of the trail. There was nothing left in my body to burn, and I was so cold, and so desperately exhausted. Would I freeze to death if I just lay down? I stopped for a second to throw up bile. My stomach was empty because I hadn't even drunk anything in miles, but I still felt like I had to pee. I could not take one more step. I had to lie down, I absolutely had to lie down. Then Carla and Javier, her pacer, caught up with me. "How are you doing?" Carla asked. I couldn't talk. Tears streamed down my face. She put both of her arms around me in a hug. "Come on," she said. "Walk with us." And so I walked with them. 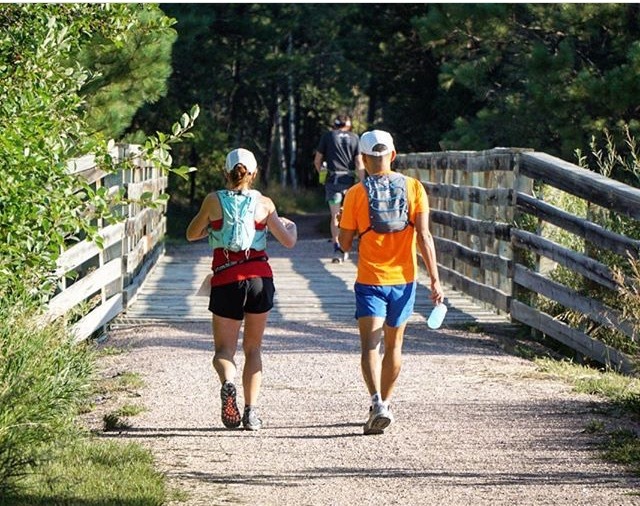 They were both from Puerto Rico, and this was Carla's first 100 mile race. This was the first time she had ever been in a place so cold that her breath froze each time she exhaled. It felt better to be with Carla and to listen to her talk. 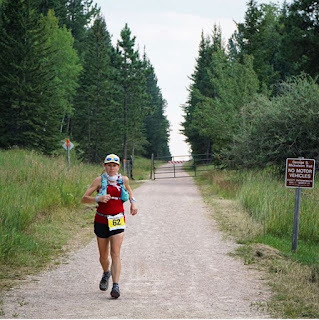 I think things might have been easier for me if I'd had a pacer, but I also knew that the only thing that had gotten me this far was having Rob drive the van around to every aid station. When chocolate soymilk was the thing I wanted, he just went to the van fridge and got it for me. When I was too cold to function, he ran to the van and got an extra pair of his own pants for me to wear. Unbeknownst to me, he had also been driving around rural South Dakota looking for an all night grocery store that sold V8, because I had on several occasions asked for this at aid stations (and they didn't have any). Carla told me that I could stay with her after we got to the mile 89.9 aid station and we could keep walking together. But I shook my head. If Rob was there with the van (and I sincerely hoped he was), I was going to get inside, lie down, and go to sleep. Sure enough, Rob was there. I hugged Carla one more time before she left, and I told Rob that if I was going to finish this race, I would absolutely have to get myself together. I had not been able to eat anything in almost 11 hours. I only had 10 miles left to cover, but my body was at its absolute limit. It was 4:30 in the morning, an hour left until sunrise, 7 hours and 30 minutes left on the clock. We got in the van and he turned the heat on high. Will was sleeping in the back, and Rob and I both crawled into the bed in the front. My clothes were drenched in sweat, and I was so cold that I shook. I dry heaved twice into a basin, set my alarm for 40 minutes, and fell asleep. I woke up just after 5 in the morning. I still felt cold and sick. I was desperate to get warm. Rob helped me find some other clothes to put on. I kept saying to him, "How am I going to go another 10 miles with no food?" Maybe it sounded like I was hysterical, but I meant it in a practical sense. Like, what are the procedures I need to undertake in order to accomplish this task? Lying down had not calmed my stomach. I felt even worse than before, with both nausea and hunger rising to excruciating levels. I took a single Ritz cracker out of a package on the counter and put it in my mouth. It might as well have been chalk or cardboard. My mouth wouldn't work to chew, my throat wouldn't work to swallow. I licked the salt off another cracker and took a sip of water. Then I stepped out of the van into a periwinkle world. The last stars faded, and the sun was just beginning to glimmer in the east. 6 and a half hours left on the clock. 10 miles to go. This was going to be hard, but so far from the hardest thing I've ever done that a comparison wouldn't even be possible. Life is hard, running easy. Step by step, each step closer to the finish. I never ran again, but I kept a decent clip, at under 20 minute miles. People occasionally caught up and passed me, giving me an encouraging word as they did. I was beyond speaking, beyond even moving my head. A thumbs up was the best I could manage. At last I reached the final aid station, and there were just 4 miles left. "It's all downhill from here," Rob said. I licked the salt off another Ritz cracker and resolutely shuffled ahead. Taking all my chances, until all my chances were spent. Two miles from the finish, I started crying. This was the first time I actually considered that there was an end in sight, that I might even pull this off. All I had to do was stay vertical, keep moving. I hoped my legs wouldn't give out on me before the end. Rob and Will were standing along the trail, just before the turn off to the high school track. "Is it still a half mile to go?" I whispered. "No," Rob replied. "You can see the finish from here." I covered my face and sobbed. Will took my other hand and led me to the track. All I had to do was make my way to the other side of it. Step by step, we did. 26 hours, 52 minutes, and 2 seconds after starting this thing, I finished. Nothing I did in this race was anywhere near as hard as what he goes through EVERY SINGLE DAY as a dyslexic child in the US Education system. All my gratitude goes to Rob and Will. I absolutely could not have done this without them being there for me all day, all night, and into the next morning. If they're willing to go through this again, I'm ready to sign up for next year. Personally, I really liked this casino, exclusively conline casino real money especially the choice of games. All games are licensed and with normal returns.